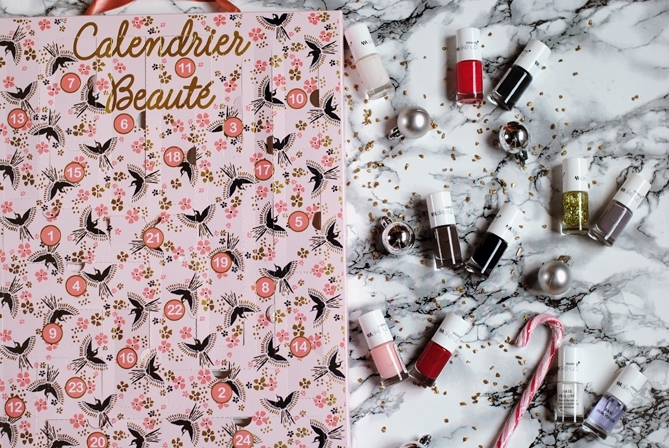 Clothes & Camera - Luxembourg Fashion and Beauty Blog: What was inside my beauty Advent calendars? For 2016 I got the Calendrier Beauté from Monoprix and a Babor Advent calendar from my fiancé. 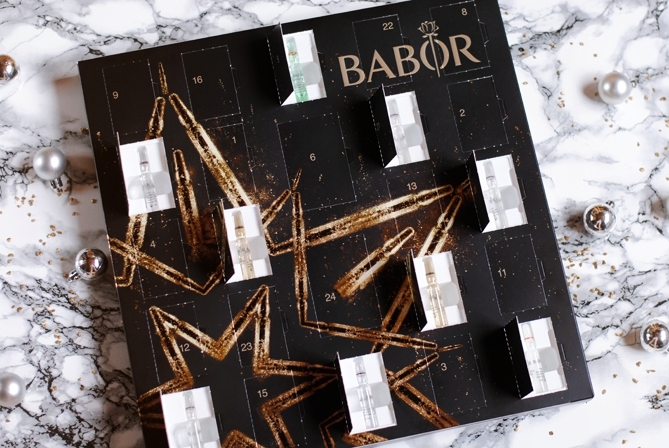 The Babor Advent calendar contained 24 intensive ampoule treatments which I haven't had the chance to try yet. However as I just finished my last face care a few minutes ago, I will start using the Babor treatments right tomorrow morning. I will probably do a post about Babor once I've used them all up, so in this post let's concentrate on the content of my Monoprix calendar. As you can see the focus in this Advent calendar was definitely on the nail polishes, which isn't bad at all because the Monoprix nail polishes are amazing. Also I couldn't be happier about the choice of colours, I mean just look at this greyish green! 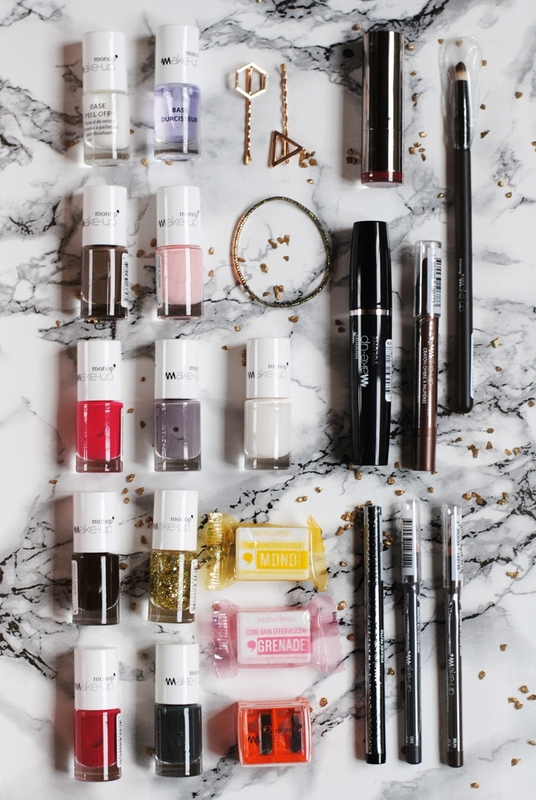 I am also eager to try the peel-off coat as I'm indeed tired of removing glitter nail polish with simple nail polish remover. As for the cosmetic products I'm really satisfied as well. I have only tested the lipstick and the felt eyeliner so far. The lipstick is amazing and leaves my lips in a glossy red (as you can see in my last outfit post). The eyeliner isn't bad for a felt one, at least it's quite long-lasting. However I prefer liquid eyeliners as they're easier to apply neatly. So that's a yay for the cosmetic products so far, but I will review them little by little and you'll be able to read about them in my empties posts. Last but not least I also want to say a few words about the other goodies, i.e. the two bobby pins and the hair tie. What I found really annoying about the Benefit Advent calendars that I used to have, were these additional goodies to fill up the calendar for almost no money. However I think that three products in the Monoprix calendar are totally ok, plus the products are actually quite nice and useful. 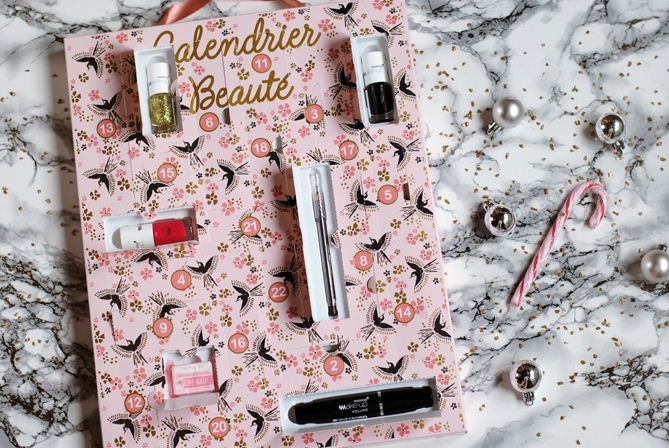 All in all that's a big YES for the Monoprix Calendrier Beauté, which turned out to be the best beauty Advent calendar I had so far! Which one did you guys try this Advent?